Danke sehr! Arigato! Merci! Toda! Teşekkür ederim! Xiè xie! Salamat! Gracias! Dhanyavaad! Many many thanks to you! On December 22, 2018 the very first PMSBOX was shipped! We are so proud of the feedback we are receiving, and are twice as excited for January’s PMSBOX to go out! If you ordered the Holiday Edition box, let us know what you think in the survey that went out earlier this week. You can now subscribe for January PMSBOX by clicking here. 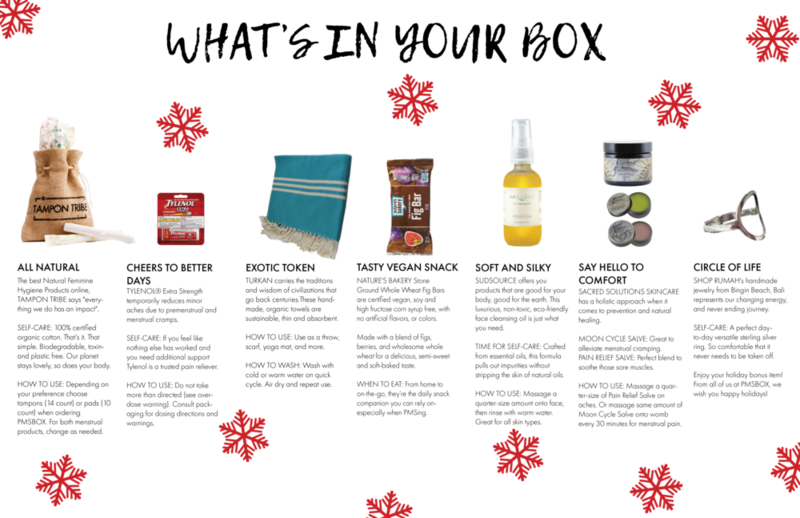 If you have not ordered yet, check out our Brand Ambassador Monica’s review of her first PMSBOX, and other reviews from our customers / brand ambassadors below. If you have any questions, or product suggestions for future boxes please send us a message. We love to hear from you all!